I was always a worrier, as long as I can remember. The other side of this sensitivity has taken me down a really beautiful path but the worry part? Well, that can be tricky at times. Here are a few ideas to help some kids in your life if they happen to be sensitive souls that tend to absorb a lot. 1. Turn the TV off! Some of us need the information to form a plan or process, most kids? Not so much. Grab your info on the internets, a constant stream of scary language like high winds, flooding and the like only revs the anxiety up. Simple explanations are plenty for kids along with a plan of action to ease the mind and heart. 2. Get your kit on! Let kids be part of the preparing process and make space for a few extras. The Spiderman flashlight is great distraction and awesome for shadow games later. Buy extra batteries so they can leave them on for as long as they want. Being part of a solution always empowers and helps us move our fear to an action place. Kit prep also gives us an opportunity to talk about what may happen after the storm so kids aren’t caught off gaurd. 3. Make a Kid kit too! Besides all the boring stuff like candles and water, have kids put together a small kit of things they love and activities for the storm and after. Now is the time for Bendaroos, small art kits, sticker books, filling up the Ipod with books, special kid snacks, etc. 4. Make a worry box or candle! Sometimes our worry is just too big to be covered by talking and preparing, sometimes we just need someone else or thing to hold it for us. Take an old shoe box and decorate it with words and pictures that bring us comfort and peace. Make a slot in the top and invite the kids to let the box hold their worries for them for a little bit, leave small squares and markers next to it. Kids don’t even have to be able to write yet, a picture works just as well. I’ve seen many adults drop a note or two in the box too! We have a little candle on our kitchen counter with some strips of paper and a pen. The wax drips over them, reminding me I am covered. 5. Go Guerrilla with your worry! 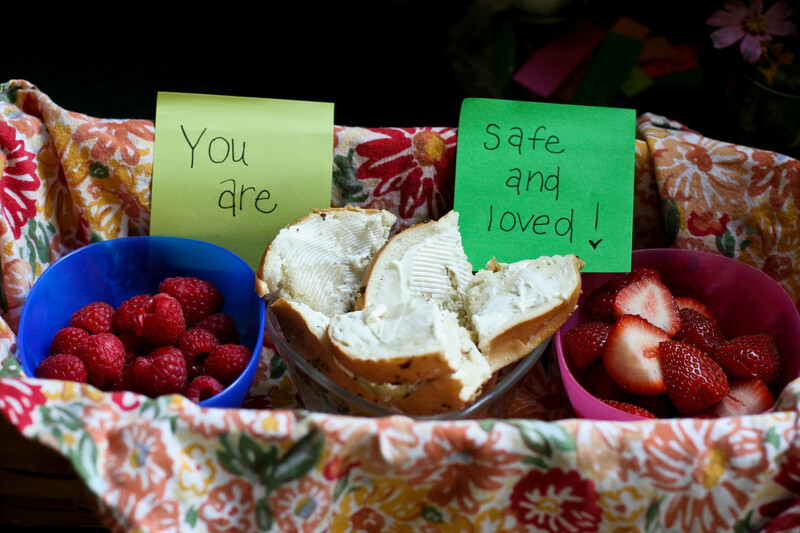 Parents- leave little notes of love and safety on bed posts, bathroom mirrors and inside the pantry. When kids are tired of talking, it’s nice to have something reminding you in a less direct way. Kids- If one kid is worried, it probably means others are too. Kids can write their own messages and leave them for other kids to find in the supply section of the grocery store, at a park or even at the gas station. Sometimes thinking of others makes us feel less alone. 6. Party it up! Kids can only worry or hold heavy thoughts so long. Now is the time for Family DJ Dance party in the living room, or a Monopoly Marathon by candle light, movies and popcorn till the power goes. Enjoy the party and chance to be together in your home for a bit, slowing down can bring all kinds of gifts. Do you have any ideas that work for you or your kids when the storm in your heart kicks up? Tell us in the comments! Glow in the dark is fun for the long hours of power outages – Dollar Tree glow sticks and assorted phosphorescent toys and stickers have saved the day a few times for us! Great ideas! Anything to be a distraction is wonderful. My daughter was terrified of storms when she was younger. I tried reasoning (didn’t work, duh) and then humor and distraction (YES)! These are terrific suggestions — thank you so much for sharing! !